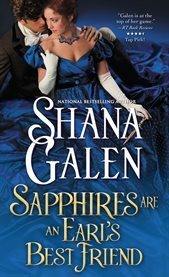 The item Sapphires are an earl's best friend, Shana Galen, (ebook) represents a specific, individual, material embodiment of a distinct intellectual or artistic creation found in Charlotte Mecklenburg Library. She Wants Him... She Wants Him Not... Lily Dawson, dubbed the Countess of Charm by the Prince Regent himself, plays the role of the courtesan flawlessly while her real purpose is spying in the service of the Crown. Her mission now is to seduce a duke to test his true loyalties. She'll do it, even though the man she really wants is Andrew Booth-Payne, Earl of Darlington-the duke's son. Andrew is furious when he finds himself rivaling his father for Lily's attention. When he uncovers Lily's mission, Andrew is faced with impossible choices. It seems he is destined to betray either his family, his country, or the longings of his own heart..